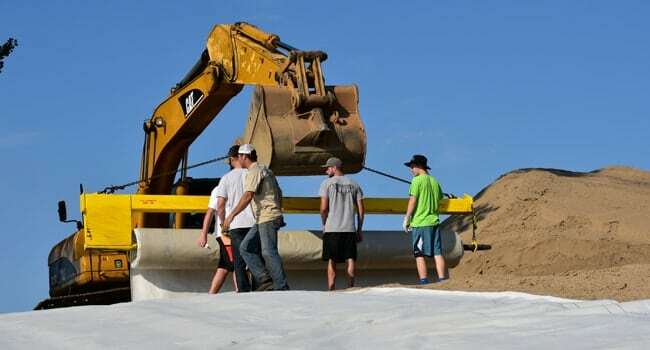 Geosynthetic clay liners – the solution to many problems! 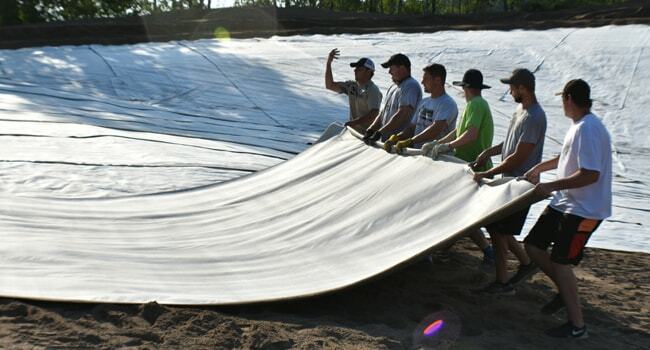 Before we explain how you can install a geosynthetic clay liner (GCL), let’s talk about the benefits of this amazing product. Let us show you how easy the installation is and provide a few useful tips along the way. In our example, we will be using a thermal lock geosynthetic clay liner. Excavate the area a minimum of 12 inches deeper than your finished grade. Make sure the subgrade is free of all rocks and debris. Compact your subgrade until you get no visible deflection (rutting). You must excavate an anchor trench on any surface that has slope greater than 7/1. Finally, make sure the equipment deploying the product is not creating any voids where the liner bridges. The nonwoven side should be facing up in order to maximize shear strength characteristics. If possible all panels should be rolled down the slope and flat areas don’t require any particular orientation. 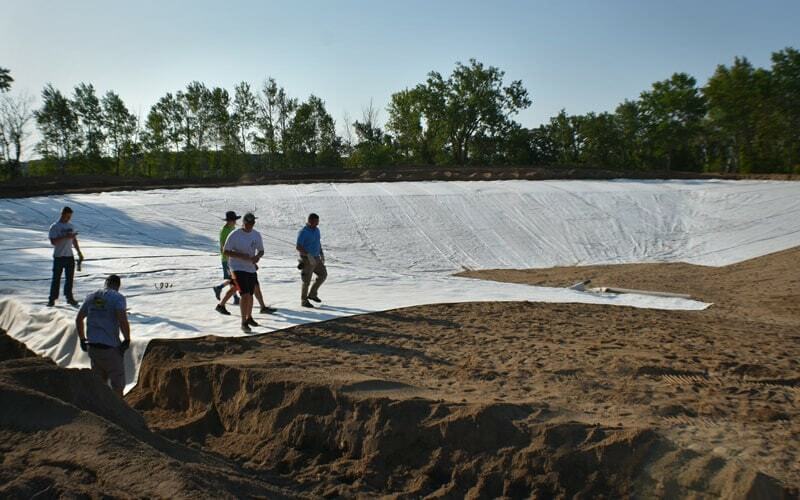 Geotextiles are marked with a min and max overlap line, which make a 12-inch minimum overlap on sides. Where one roll ends and another begins you should have an overlap of 24 inches. Sprinkle a quarter pound per linear foot of Sodium Bentonite on the overlaps to seal them. Finally, place a soil cover free of sharp-edged stones (greater than 2 inches in size) at a depth of 12-24 inches. GCLs should be covered at the end of the day and not exposed overnight. It could absorb water overnight and swell, losing performance. Any penetrations (like a pipe) you would need to fashion a boot out of GCL and secure that around the pipe and liberal apply Sodium Bentonite around the penetration to make sure it seals. Soils should be placed with low ground pressure equipment (tracked equipment). Avoid puncturing the GCL by not making sharp turns, pivots or sudden starts or stops. The equipment should drive directly on top of the soil cover and not directly on the GCL. If the soil is steeper than 4/1 then the soil should be pushed up the slope to avoid tearing the GCL.